The confrontation between the "Europeanists" and the "Sovereignists" hides what the reality actually is – a Europeanism without Europe and a sovereignism without sovereignty. The politico-media tornado lifted by the confrontation between the “Europeanists” and the “Sovereignists” hides what the reality actually is – a Europeanism without Europe and a sovereignism without sovereignty. The politician who is brandishing the banner of Europeism at the moment is President Emmanuel Macron, in an attempt to advance French power not only in Europe, but also in Africa. France, co-promoter with the USA of NATO’s war which in 2011 demolished the Libyan State (a war in which Italy played a major role), is trying by any means possible to control Libya and her rich resources – enormous reserves of oil, natural gas and fossil water – not to mention its territory, which is of great geostrategic importance. For this purpose, Macron is supporting the militias who are fighting the “government” of Fayez al Serraj, also supported by Italy, which, with ENI (National Hydrocarbon Company) holds major interests in the country. This is only one example of the way in which the European Union, founded on the interests of the economic and financial oligarchies of the great powers, is beginning to crumble under the assaults of its economic and political oppositions, of which the migrant question is only the tip of the iceberg. Faced with the predominance of France and Germany, the Italian 5 Stars-League government has made a specific choice – to increase the weight of Italy by linking itself even more strongly to the United States. 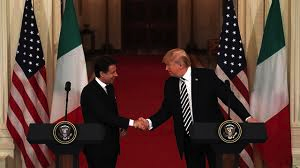 Thus the meeting between Prime Minister Guiseppe Conte and President Donald Trump, to which the media paid little attention. And yet in this meeting, a number of decisions were taken which have a notable influence on the international position of Italy. Above all, it was decided to create a “permanent Italy-USA chamber of operations in the Greater Mediterranean”, in other words in the area which, in US / NATO strategy, stretches from the Atlantic to the Black Sea and, to the South, to the Persian Gulf and the Indian Ocean. In reality, this chamber of operations is in the hands of the USA, or more specifically, the Pentagon, while Italy is only awarded a secondary role as assistant, and generally, the role of extra. According to Conte, on the contrary, “this is a strategic cooperation, almost a twin position, by which Italy becomes a pont of reference in Europe, and the privileged interlocutor of the United States for the main challenges we will have to face”. This announces a later reinforcement of the “strategic cooperation” with the United States, in other words, a “privileged role” for Italy as the launching point for US forces, including nuclear forces, to the East as well as the South. “The American administration recognises that Italy has a leadership role as a nation which promotes the stabilisation of Libya”, declared Conte, implicitly announcing that Italy, and not France (less trustworthy in the eyes of Washington), had received from the White House the mission of “stabilising” Libya. All we need now is to work out how to do that. The International Conference on Libya will not be enough – this was supposed to be held in Italy in the autumn, before the Libyan “elections” sponsored by France, which should be held in December. It will also need a military engagement directly on the ground, and a cost in human lives and material as well as unexpected outcomes. The “sovereignist” choice by the Conte government will therefore reduce national sovereignty, by making Italy even more dependent to what is decided in Washington, not only the White House, but the Pentagon and the Intelligance Community, composed of the 17 federal agencies which specialise inspying and secret operations. The true sovereignist choice would be the genuine application of the constitutional principle according to which Italy repudiates war as an instrument of offense to the liberty of other peoples and as a means for the resolution of international conflicts.